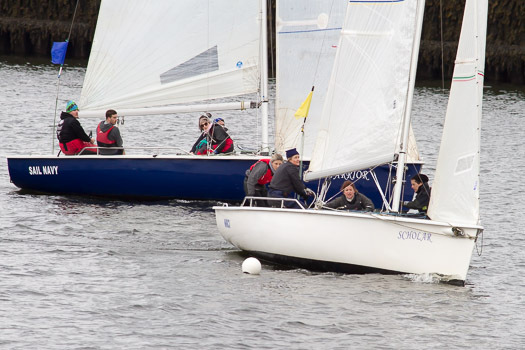 Overall winner Laura Dillon of Howth (white hull) leads a one on one match race on the river Lee. Photo Bob Bateman. Scroll down for more event photos below. #matchracing – Laura Dillon sailing with Olympic helmswoman Maria Coleman were the winners of the Cork Institute of Technology (CIT) hosted Invitational Match Racing event in aid of the Nathan Kirwan Trust in the heart of the Cork city on the River Lee. Six teams competed including University College Cork, University Limerick, Cork Institute of Technology and Baltimore and Howth Ladies all battling it. The event was raced in 1720 Sportsboats with a crew of 5 per boat.